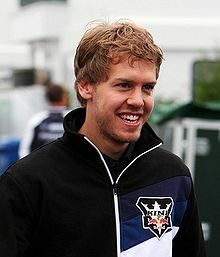 10 – Points separating the top five drivers after defending Formula 1 world champion Sebastian Vettel won the Bahrain Grand Prix. His first victory of the season catapulted him from fifth to first in the standings, with 53 points. 4 – The win by Red Bull’s Vettel marked the first time since 1983 the first four races of the season have been won by four different drivers (Button, Alonso, Rosberg, Vettel) from four different teams (McLaren, Ferrari, Mercedes, Red Bull). 2 – Wilson Kipsang and defending champion Mary Keitany secured a Kenyan double by winning the men’s and women’s races at the London Marathon. 62,800,000 – Amount (in dollars) spent at auction on the 127 cricketers selected by Indian Premier League teams. 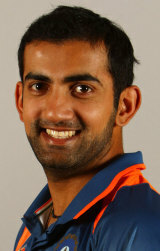 Indian batsman Gautam Gambhir fetched $2.4m, a new record. 40 – South Africa‘s Jacques Kallis hit his 39th and 40th Test hundreds in the third Test against India in Cape Town, to move him ahead of Ricky Ponting into second place on the all-time list of century-makers. He trails only Sachin Tendulkar (51). The match ended in a draw, meaning the series finished level at 1-1. 67 – Roger Federer opened his 2011 campaign by winning the Qatar Open for the third time with a 6-3 6-4 win over Nikolay Davydenko. It is his 67th career title. 5 – Andy Murray has dropped to number five in the world ahead of the Australian Open after Robin Soderling‘s win in the Brisbane International. 4 – Cristiano Ronaldo scored his fourth hat-trick of the 2010/11 season in Real Madrid‘s 4-2 win over Villarreal. He now has 63 goals in 62 games since joining Madrid at the start of the 2009/10 season. 9 – Adrian Lewis had a nine-dart finish en route to his first PDC darts world title, as he defeated Gary Anderson 7-5 in the final. 3 – Martin Adams won his third BDO darts world title – and his second in succession – with a 7-5 win over Dean Winstanley yesterday. 48 – Age of former British heavyweight boxing champion Gary Mason, who died after colliding with a van while cycling. 1 – England‘s first innings was the first time ever in a Test Match innings that the sixth, seventh and eighth wickets all produced century partnerships (154, 107 and 102 runs, respectively). 4 – England topped 500 for the fourth time this series, only the fourth time a team has achieved this – and the first time ever by England. 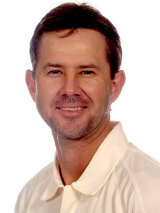 16.14 – Batting average of Australian captain Ricky Ponting, who scored just 113 runs in four Tests. Bowlers Peter Siddle and Mitchell Johnson both scored more runs and had a higher batting average than Ponting. 9 – Despite a poor series with the bat, Paul Collingwood had nine catches – one more than Australian wicketkeeper Brad Haddin. 0 – Stuart Broad’s first-ball duck in his only innings in Brisbane meant he was the only player not to score a run in the entire series. 3 – Australia lost by an innings three times during the series – the first time they have done so against any opponent. For more facts and stats from the Ashes, read The Ashes in numbers. 11 – Manchester United led Stoke 1-0 at half-time of their game on Tuesday night. They have been ahead at the interval in all 11 of their home league matches this season. United eventually ran out 2-1 winners. 3 – The United vs Stoke game featured only three shots on target – the three goals. 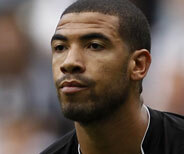 3 – Leon Best scored a hat-trick in Newcastle‘s 5-0 win over West Ham. He is the third Newcastle player to score three times in a Premier League game this season (also Andy Carroll and Kevin Nolan). 14 – Birmingham‘s last-minute 2-1 win at Blackpool ended a run of 14 successive away league games without a victory. 5 – Fulham‘s last five Premier League home wins have come against clubs whose names start with the letter W. They beat West Bromwich Albion 3-0 midweek. 0 – In their 0-0 draw at Arsenal, Manchester City failed to register a shot on target in a Premier League game for the first time since December 2007. 52 – Roy Hodgson became the first Liverpool manager to leave the club without winning a trophy since Phil Taylor in 1959 – a gap of 52 years. 9 – Number of teams beaten by clubs from lower divisions in the third round to date (out of 30 matches played). 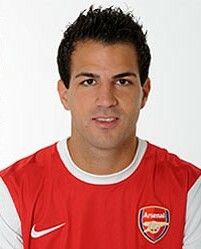 29 – Cesc Fàbregas‘s last-minute equaliser for Arsenal against Leeds means they are now unbeaten in their last 28 home matches in the FA Cup. Only Sheffield Wednesday’s 32-match streak from 1923-1947 is longer. 13 – League Two’s Stevenage became only the 13th fourth tier/non-league side to knock out a top-flight team in the FA Cup since 1980, defeating Newcastle 3-1. 3 – All three North-East teams (Newcastle, Middlesbrough and Sunderland) were knocked out on Saturday by opposition from at least two divisions below them (Stevenage, Burton Albion and Notts County respectively). 1 – As a result of their 2-1 win over Middlesbrough, Burton Albion reached the fourth round for the first time in their history. It was also the first time they have beaten a club from the top two divisions. 99 – Number of league places between Bolton (of the Premier League) and York City (of the Conference National). Bolton eventually ran out 2-0 winners, but did not score until the 83rd minute. 10 – QPR‘s 1-0 defeat at Blackburn means it is now 10 years since they last won an FA Cup tie. 6 – Steven Gerrard‘s red card in Liverpool’s 1-0 defeat at Manchester United was the sixth red card of his Liverpool career (but his first in nearly five years). 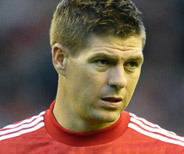 He was the seventh player to be sent off in the last nine meetings between the two clubs. 4 – Referee Howard Webb has awarded penalties to United in four of the last six matches he has officiated at Old Trafford. 5 – Chelsea’s 7-0 win over managerless Ipswich is the fifth time in 12 months they have scored at least seven goals in a game. 1 – The Seattle Seahawks, who won the NFC West division with a 7-9 record, became the first team with a losing record in NFL history to win a playoff game, by defeating the reigning Super Bowl champion New Orleans Saints in a wild 41-36 shootout. 1 – Former Seahawk Julius Jones scored on two touchdown runs, becoming the first player in NFL history to score a post-season touchdown against a team who released him in the same season. 4 – This is the fourth year in a row in which the defending Super Bowl champions have lost their first playoff game. 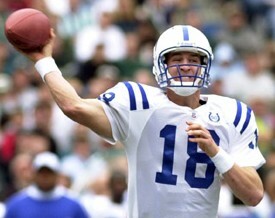 47.4% – The postseason win-loss percentage of Indianapolis Colts quarterback Peyton Manning – more than 20% less than his regular season record. The Colts were knocked out of the playoffs 17-16 by the New York Jets when Nick Folk kicked a 32-yard field goal as time expired. 1 – Victory over the Colts meant the Jets have now won a playoff game in consecutive years for the first time in their history. 9 – Defeat for the Saints and Colts meant that neither of the previous year’s Super Bowl participants have made it past the first round of the playoffs for only the ninth time in NFL history. 5 – The Baltimore Ravens forced five turnovers as they eased past Kansas City 30-7. 12.2 – Points per postseason game allowed by the Ravens in their history – the lowest by any NFL team. 1 – The Ravens’ Joe Flacco became the first starting quarterback in NFL history to win a playoff game in each of his first three seasons. 123 – Green Bay rookie running back James Starks – who did not play his first game until December 5th – rushed for 123 yards as the Packers outlasted the Philadelphia Eagles 21-16. It was the highest ever single-game rushing total gained by a Green Bay rookie.